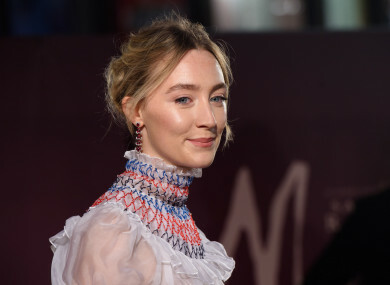 SAOIRSE RONAN has said it was because of her mother that she never became a ‘victim’ to abusive behaviour in Hollywood. She said her ‘mam’ is an integral part of her life adding she “was always with me” when the actress was working as a child and that devices like FaceTime keep them in close contact. Ronan also touched on the Irish border issue and Brexit saying, “it’s such a feckin’ mess” and expressed her fears it will revive past divisions. Ronan, who has been nominated for three Oscars (Atonement, Brooklyn and Ladybird), will be playing Mary Queen of Scots in the upcoming historical film opposite Margot Robbie. Ronan will also star in the upcoming adaption of Little Women due at the end of this year. Email “'Because of her I was never a victim': Saoirse Ronan says her mother protected her from abuse in Hollywood”. Feedback on “'Because of her I was never a victim': Saoirse Ronan says her mother protected her from abuse in Hollywood”.